The family are all dressed in their finest green clothes, kids proudly sporting their homemade badges and just before you head to the local parade someone always asks… “Where is the Shamrock?” Before you go scurrying out to scan the front lawn you might like to know what you are looking for and why it has become such a big part of our National Day. So firstly, WHAT IS A SHAMROCK? What we refer to as the shamrock is actually a type of clover. 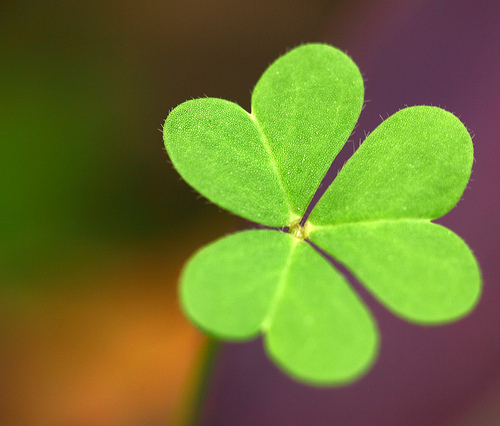 In fact, there is no “shamrock plant”, the word shamrock comes from the Irish word “seamair og“, meaning young clover! There are approximately 300 plants in the clover (Trifolium/trefoil) genus and these are legumous/pea plants. Clover plants have (typically) three lobed leaves. WHICH CLOVER PLANT IS THE ONE WE CALL A SHAMROCK? There seems to be three likely candidates for the title of the “real” shamrock, namely, the suckling/yellow clover (Trifolium dubium), the white clover (Trifolium repens) and the red clover (Trifolium pratense). Which one holds the ultimate “shamrock” title? It would appear they all do! All three types can be seen adorning the Irish around the country on March 17th. The most popular though, and the one officially termed shamrock by the Department of Agriculture is the yellow clover (T. dubium). Don’t feel bad, however, if you think you might have accidentally sported an unofficial shamrock, as classification is difficult in March when the plants have not yet flowered and given the game away. SO WHY DO WE USE THE SHAMROCK ON ST. PATRICK’S DAY? Although the shamrock is associated with St. Patrick, it was likely already in use in Ireland as a popular symbol of the Tua Cross among Celtic Druids. The number three was also considered a mystical number in the Druidic religion, making the shamrock a sacred plant. It is told that St. Patrick used the Shamrock to symbolize the concept of the blessed trinity as he preached of Christianity, perhaps wisely drawing on its sacred and popular status. Chloropyl is the pigment responsible for the predominant green colour of our “Emerald Isle”, shamrock included. It is interesting to note though that St. Patrick was originally associated with the colour BLUE, and this only changed in the 19th century when green became the colour associated with Ireland. We are lucky such an abundant of shamrock (and clover) in our pastures and lawns! These plants are a highly nutritious food source for livestock, being rich in minerals such as phosphorus and calcium. The flowers also provide a rich supply of nectar for many insects, but the thing that makes them so special is the fact that clover plants enjoy a symbiotic relationship with nitrogen fixing bacteria (present in nodes on the plant). These bacteria (rhizobium) are capable of extracting nitrogen from the atmosphere and converting it into ammonia which is added to the soil as a natural fertilizer. Clover can add up to 150 kg per hectare of nitrogen to the soil and increases availability of other nutrients for following crops. All this from such a humble looking plant, what a great National Symbol, I will be wearing mine with pride this St. Patrick’s Day, how about you?